(August 21, 2000) LB activists rallied yesterday at NLB's Scherer Park, preparing for a fight with City Hall over plans to build a new NLB Police Substation on part of the park land. 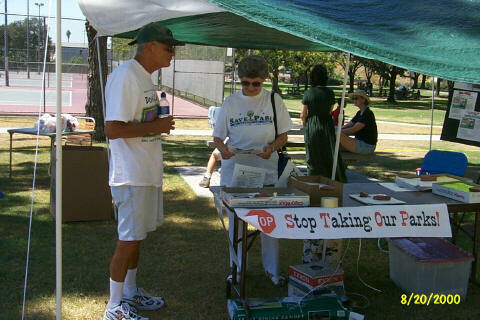 The "Sunday In the Park" rally on behalf of Friends of Scherer Park drew veteran activists from across the city including Ann Cantrell (in photo behind table), Diana Mann, Gordon Labedz, Marshall Blesofsky, Colette McLaughlin and Jim Sturm. Lester Denevan brought his 90+ year old mother. Also attending were R. Gigi Fast Elk Porter, President of Friends of Scherer Park, and Reggie Bannister whose organizational handiwork helped bring the rally to fruition. The activists' skills were evident as an informational tent overflowed with fliers, photos, maps and petitions to the City Council. In written materials, Friends of Scherer Park charged that more than three acres of park land will be turned into a "major police compound with over 200 parking spaces and holding cells for criminals." Scherer Park, located on the southwest corner of Atlantic Avenue and Del Amo Boulevard, is already home to a smaller, temporary NLB substation. To illustrate the amount of additional Scherer Park land that they say would be lost, activists on Sunday strung yellow police tape along the ground, outlining the area they said would be consumed based on current plans for the new police facility including its perimeter fence to enclose parking spaces. To the left is a southwestward view from the back of the current NLB substation. In the foreground is a portion of the park land activists said would be taken by the new facility (including its parking), extending nearly to a duck pond and stand of trees visible outside the line of yellow tape. 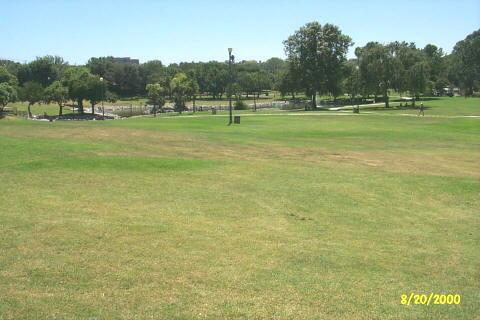 Additional park land would also be taken turning westward, outside camera view to the right. To show with precision the amount and location of Scherer Park land City Hall's plans would take, and leave, LBReport.com will shortly post a detailed map in our Reference sction of the facility as curently proposed. A flier from Friends of Scherer Park says that if the new NLB Police facility is built in Scherer Park, property values will decline, old growth trees will be destroyed and 8th Council district park land will be lost to mitigation in the 9th Council district. At a stormy City Council meeting several months ago, pro-park activists found themselves publicly opposed by a contingent of Bixby Knolls and NLB neighborhood leaders who support putting the new police facility in Scherer Park. (Speakers from areas adjoining the park were split.) City Hall's plan was backed by now retired 8th district Councilman Jeff Kellogg (who has been succeeded by his staff aide, Rob Webb) and 9th district (NLB) Councilman Jerry Shultz. Friends of Scherer Park say in a flier they are not anti-police, just pro parks. "City Officials Are Taking Your [emphasis in original] Park," their flier states, "Tell Them, this is...Land of the Free -- Not Free Land."